Uruguay in particular. The Spanish spoken there is the most easily identified because of its pronunciation. The most salient feature of the pronunciation of Spanish in this region is the way in which the letters Y and LL are pronounced. Rather than both of these being pronounced, as elsewhere in the Spanish-speaking world, almost like the English Y when it is a consonant (as in the word yes), they are both pronounced like the Z in the word azure or the J in the French name Jacques. 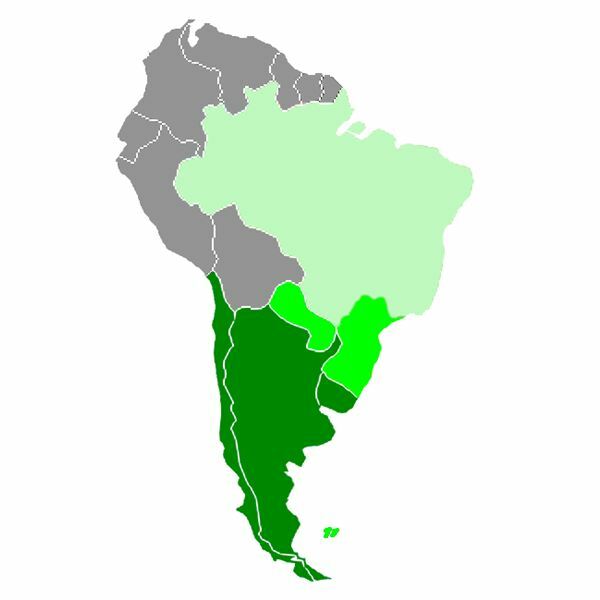 Another feature of the pronunciation of Spanish in the Southern Cone is the fact that they tend to intonate Spanish much like Italian — this is due to the very heavy immigration from southern Italy beginning in the late nineteenth century (at the same time that many Italians came to the USA). Italian surnames may easily outnumber Spanish ones in Argentina and Uruguay, at least in the capital cities of Buenos Aires and Montevideo. There are a few lexical and morphological features of Argentine Spanish that make it easy to identify. Instead of tú, they typically use che. In fact, that is why the famous revolutionary Ernesto Guevara Lynch is universally known by his nickname — he used che to address his associates and friends and they nicknamed him Che. The main morphological feature that distinguishes the Spanish of the Southern Cone is a phenomenon known as voseo — the pronoun vos is used as a form of general address, along with its corresponding verb form which evolved from the vosotros form of verbs. It is not plural, however (ustedes is used for the plural, as elsewhere in the Americas). Thus, instead of tú vienes, they would say vos venís; instead of tú hablas, they would say vos hablás; tú comes becomes vos comés, and so forth. For the reflexive, indirect and direct object pronoun corresponding to tú however, they retain the use of te. Thus they say ¿Te sentís bien? instead of ¿Te sientes bien? Finally, no discussion about Argentine Spanish would be complete without at least noting the existence of the very special dialect of Buenos Aires known as Lunfardo. It is associated with the world of tango. In fact, there is an award-winning website all about Tango where a Lunfardo-to-Spanish dictionary may be found — containing about 16,000 items!